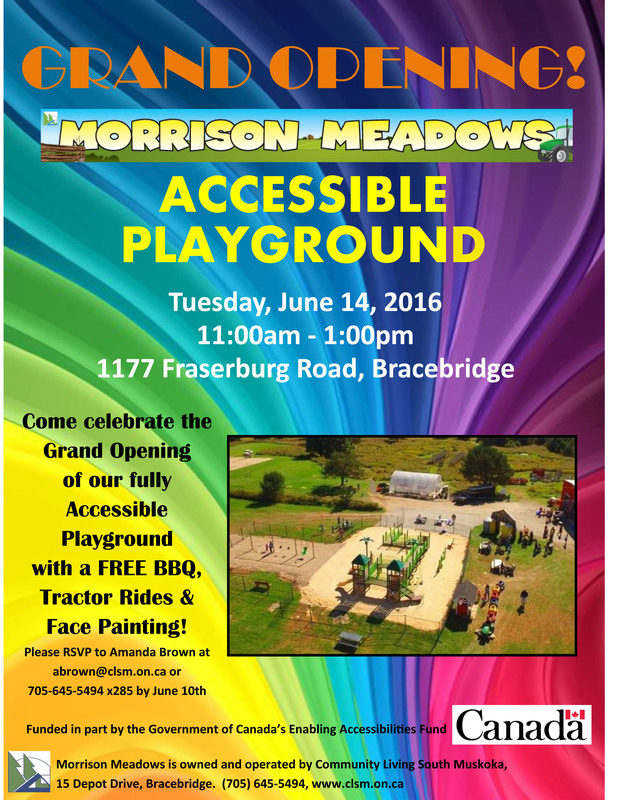 Community Living South Muskoka is hosting the grand opening of their accessible playground on Tuesday, June 14, 2016 from 11am-1pm at Morrison Meadows. Further information can be found here. There are three upcoming workshops for parents on Assistive Technology, Apple, Android, Google: all workshops are bring your own device. Information on dates, times and locations to follow. • Saturday April 16, 2016 from 1pm-4pm Shona Casola is presenting “Conversation about Differences, How Language Shapes People’s Understanding of Self.” Further information can be found at this link. • Video created as an introduction to ASD and to support customer service professionals when they provide services to people with ASD. The video is very accessible and entertaining and would be a great tool to share with staff and students. • See the application information forms for details. Deadline for applications is May 6, 2016. Meeting cancelled due to inclement weather. • CLSM is hosting a Leap Year Party on Saturday, February 27, 2016 at LIV Muskoka including live music, silent auction and games. All are welcome. • The FASD ONE Biannual conference is occurring on March 24, 2016 in Toronto. How are they being used in the classroom and what you need to know to get involved. We are very excited to be bringing DJ to the City of Kawartha Lakes. Come join us for this energetic and inspiring presentation. To register email: ldapjanice@gmail.com or call 705-324-2596. Superintendent MacIver and District Principal Johnston shared updates with SEAC regarding initiatives, professional development opportunities and meetings occurring in the Board and in the Department of Specialized Services. District Principal Jennifer Johnston reviewed the background and context of the TLDSB Parent Guide to Special Education which will be reviewed and updated this year at the request of SEAC. An outline of topics to discuss at each meeting in 2015-2016 in relation to the Guide was shared with SEAC. Janice Balfour, representative on behalf of LDAP advised: On Monday the Children’s Services Council in Kawartha Lakes/ Haliburton is hosting an FASD Community Partner session to discuss with partners what services are available/ what is needed to support students and families with FASD. • The Ministry has released their roundtable report and continues working on provincial strategy for FASD which includes promoting awareness, prevention, screening, diagnostics, front end professional/ paraprofessional training etc. The report will be shared with SEAC. • There is only a small population attending the local support group currently; looking for thoughts/ recommendations or suggestions to promote support groups locally and welcome SEAC members to share information with individuals/ families they may know with Tourette’s. LDAP has commenced it’s tutoring program. Autism Ontario is hosting a Webinar on October 28, 2015 from 12pm-1pm with Dr. Wendy Roberts, Developmental Paediatrician, on Navigating the System After and ASD Diagnosis. Community Living Huntsville hosts an All Abilities Dance Troupe 2x per week; open to anyone 13 and older. Tourette Canada is hosting it’s National Conference in Niagara Falls from October 15-17, 2015.